Karen Wylie is an inspirational speaker and writer. Throughout the years, her words have impacted many people in a positive way. She facilitates workshops and retreats and leads journeys to sacred sites around the world. 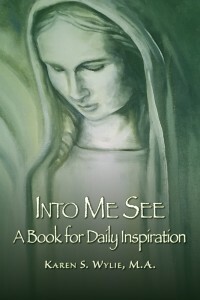 Her latest book, Into Me See, A Book for Daily Inspiration, is available on Amazon.com or you can contact Karen directly for additional copies. Karen is devoted to assisting you in revealing your authentic nature and living from a place of inner confidence and empowerment.